The following antiques are available for SALE. Contact us for further information on these pieces and to request items of interest. Stirrups made of native Rauli wood. 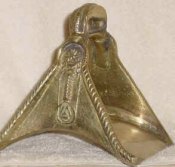 Pair of brass stirrups with porcelain inlay. from Spanish Colonial period, Chile. Copper bowl with handles called "braseros". 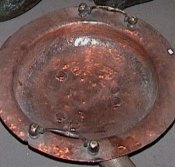 Used for holding hot coals for heating or cooking. Copper milk can with brass plate of origin. Large brass bell from mission outside Santiago, Chile. For further information on any of these works or to request works by artists not shown here, please contact us. Please direct technical questions or comments to our . Website built and maintained by NimbleForce Creations.